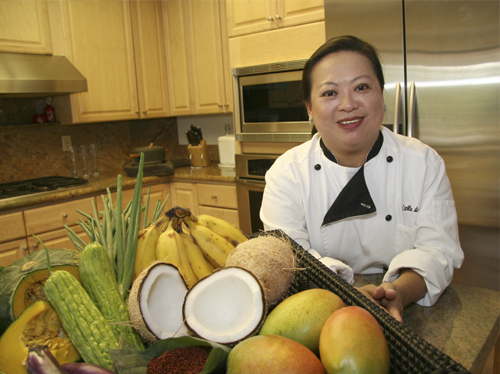 Manila-born Cecilia M. de Castro has a long and distinguished career in the culinary arts industry. While finishing her B.S. degree in Food Science & Nutrition, Chef Cecilia apprenticed at Ma Cuisine, Ma Maison’s Cooking School. While working at Ma Cuisine/Ma Maison, Chef Cecilia completed a Hotel & Restaurant Management program. After a year of working at Ma Cuisine/Ma Maison under Chef Wolfgang Puck and restaurateur Patrick Terrail, and serving as the Associate Director of the restaurant’s Cooking School, Chef Cecilia began teaching and developing culinary programs, such as Basics Hand-on Training and Professional Chefs Programs. In 1985, she was invited by the University of California Los Angeles Extension to develop a certificate program in Culinary Arts that eventually grew into four certificate programs – Chefs Program, Pastry Program, Catering Program and Wine Program. During her thirteen year teaching career at UCLA, Chef Cecilia was awarded the Educator of the Year Award several times. In 1988, while running both Ma Cuisine & the UCLA Culinary Programs, she developed a third program for the Westlake Culinary Institute. In 2004, Chef Cecilia was nominated for Educator of the Year for IACP (International Association of Culinary Professionals) and the school was awarded the 2007 Avocational Cooking School Award of Excellence, under her tutelage. In addition, Chef Cecilia has taught cooking classes at California State University Northridge (“CSUN”) Extension Program and along with CSUN’s Food Science department Master’s Program, she helped develop a Nutrition & Cooking Program for children to find an answer to the growing concern of childhood obesity. For three years, Chef Cecilia teamed up with the summer program at the Marilyn Magaram Center (MMC) for Food Science, Nutrition and Dietetics at CSUN and the Department of Education to provide a five-week daily cooking and nutrition course, for children ages 7-11. Since Fall 2007, Chef Cecilia has been a member of the Advisory Board of CSUN – MMC for Food Science, Nutrition and Dietitics. In 2009, Cecilia started the Academy of Culinary Education. Not many chefs have had the good fortune of working with the culinary world’s icons. Chef Cecilia served as a culinary assistant to Julia Child when she appeared on Good Morning America in the 1980’s, an experience of a lifetime. For over 30 years, Chef Cecilia has collaborated with world renowned Chef Wolfgang Puck. She was fortunate enough to serve as a culinary producer for the Emmy Award winning Wolfgang Puck Show for five seasons on the Food Network when it first was launched and on the show, Fine Living. Chef Cecelia continues to work with Chef Puck on his cookbook developments, product/recipe development for the Home Shopping Network and Spago, as well as food events such as the Academy Awards Governor’s Ball and the American Food & Wine Festivals. Chef Cecilia has appeared in many radio and television shows, including Good Morning America, Our Magazine, Alive & Well, Paul Wallach Radio Show, Two Hot Tamale Radio Show on KFI and has been a frequent guest for cooking segments at KCSI 18-“Kababayan LA with Jannelle So”. Additionally, Chef Cecilia has been featured in many publications, including Bon Appetit, Gourmet, Los Angeles Times, Daily News, Ventura County Star, Acorn, Santa Monica Courier, Asian Journal, and numerous other trade journals. Her love for travel, dining and experimentation are a part of who Chef Cecilia is. She has had the good fortune of serving as a consultant to many domestic and international food companies, chefs and food establishments. She is sought after as a cooking teacher and spokesperson/demonstrator for various food companies, especially to promote Philippine and other Asian ingredients and food products. She has organized and headlined Philippine food expos in Los Angeles, San Francisco, New Jersey and Guam. As a caterer/event coordinator, Chef Cecilia’s clientele range from entertainment industry, corporations, individuals, heads-of-states and non-profit organizations such as A3M, City of LA, LAAPAHM, Special Olympics, and Meals on Wheels. One of the highlights of her numerous culinary productions was when she was asked by the Philippine Consulate General’s office in Los Angeles to cater and produce the reception for then President Fidel Ramos, the VIP guests and members of the press in his official visit to Los Angeles, cook dinner for Philippiine President Gloria Arroyo and her family in 2004, and Mayor James Hahn’s 2005 final LAAPAHM closing reception at the grounds of City Hall for 2,000 guests. Chef Cecilia is an active member of the LA Chapter of Les Dames d’Escoffier, whose membership includes the top women in the culinary field. She is a Certified Culinary Professional) (“CCP”) with the International Association of Culinary Professionals (“IACP”). In 1994, when the Women Chefs and Restaurateurs (“WCR”) were launched, she was asked to head the LA Chapter for its first three years and increased its membership substantially. Chef Cecilia is the founder and committee chair of the Culinary Arts Pavilion at Festival of Philippine Arts & Culture (“FPAC”) since its inception in 2002 which saw an attendance of over 25,000 in 2006. A very active fundraiser, Chef Cecilia has been instrumental in getting chefs, restaurateurs and food companies to volunteer and sponsor events such as Special Olympics’ Pier del Sol, National Kidney Foundation’s Great Chefs of LA, Share Our Strength Taste of a Nation, Senior Concern, Meals on Wheels, Asians for Miracle Marrow Match A3M, Casa Pacifica, California Migrant Farm Workers, women and children’s shelters, and has devoted her time to help raise millions of dollars for numerous non-profit organizations. Chef Cecilia also volunteers annually for the Habitat for Humanity Power Women Power Tools event and Cystic Fibrosis. As an active member of the Careers in Culinary Arts Program (“CCAP”), she trains and advises high school students to compete for culinary scholarships. She also serves as a judge during its final competitions. Chef Cecilia has also been selected judge many cooking contests from the LA County Fair to the Lobsterfest Cooking Contest and the upcoming 2009 Casa Pacifica Ventura County Food & Wine Festival. Chef Cecilia currently serves as a member of the Board of the Mama Sita Foundation and is actively involved in training and giving scholarships to individuals currently working in the food industry. Inspired by her parents belief in education and concern for others, Chef Cecilia continues to pursue her missions; to teach and share her experiences in the culinary field and assist her students to gain entry into the work force; to bring awareness of proper nutrition specially with the younger generation; support organic sustainable farming and artisanal powers and producers; to bring forward her Filipino heritage through its culture and cuisine; and to continue her fundraising efforts to help raise money for organizations that help, feed and educate children and all those in need.